Sure, it looks like a children’s book with its illustrations and thick card pages, but the Scratch & Sniff Book of Weed is definitely not for the kids. Yes, the title says it all: this is a scratch-and-sniff book of weed. But what it doesn’t say is that the entertaining illustrated guide covers 4,000 years of weed and its significance, from the psychoactive, cultural, medical and sexual. Best of all, it’s legal in all 50 states, too. Sure, it looks like a children’s book – especially with its illustrations and thick card pages – but the Scratch & Sniff Book of Weed is definitely not for the kids. The book is actually subtitled “A physiological, sexual, historical, botanical and cultural trip through the world of cannabis” that tells of the history, its medical use and even some of the science behind its effects. So, who exactly is it for? It could be the perfect gift for yourself, that friend who is cannabis connoisseur or even one that is just curious about cannabis. With chapters on everything from the movement to have weed legalized to weed in the boudoir, the Scratch & Sniff Book of Weed has it all covered, in lots of colors and, given its title, smells. The 22-page book, set to be released on April 20, is a collaboration between Eve Epstein (a pop culture writer) and Seth Matlins (marketing guru). 22 pages might not sound like much, but it has almost as many scratch-and-sniff scents (20 of them, to be precise), which accompany the aforementioned subjects and more, such as just why the munchies occur. To be clear, none of the smelly spots actually smell like weed. The Pineapple Express smells like pineapple and the Blueberry Kush smells like blueberry. In the chapter titled “You, On Weed,” the bit about cottonmouth has a spot that smells like cotton candy. The chapter “Some Dope Dope,” features information about cannabis, so there’s a pepper scent to remind readers that black peppercorns calm anxiety when the high gets too intense. 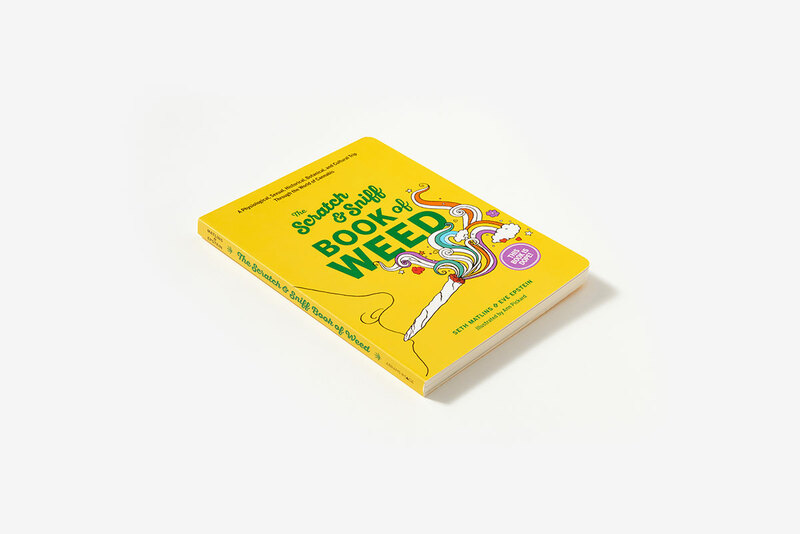 While the first run of books is nearly sold (via presale) on Amazon, the Scratch & Sniff Book of Weed will also be available on storefront tables at Barnes & Noble, starting from April 20. Plus, the authors are donating 10 percent of their profits to the Drug Policy Alliance. Are you not the scratch-and-sniff kind of person? Instead, you should check out The Stoner’s Coloring Book, which is exactly what you think it is: a coloring book for adults. It’s not just for combating boredom, either, as coloring is really good for your brain – it also has certain de-stressing properties, too. So, is it Christmas yet? No, but it is almost 4/20, which is even better.